his conference coincided with the exhibition Forgotten Empire: the World of Ancient Persia, which was on display at the British Museum (9 September 2005 – 8 January 2006). Prior to Alexander’s conquest, the Persian Empire was the mightiest the Middle East had yet seen. Ranging from Egypt in the west to Pakistan in the east, the main seat of power was at Persepolis in the heart of southern Iran. Sculptures illustrate the pre-eminence of the enthroned Great King, surrounded by his Court and supported by representatives of the far-flung provinces. Depictions and actual finds demonstrate the empire-wide circulation of high-status objects, including gold and silver vessels, furniture and inlaid jewellery made within a so-called ‘Achaemenid Court Style’. This was also a period of improved communications with a Royal Road system and an early version of the Suez canal linking the river Nile with the Red Sea. Religious realpolitik allowed the Persian rulers to tolerate local religious diversity and the ‘Cyrus Cylinder’ is therefore sometimes regarded as a charter of human rights. 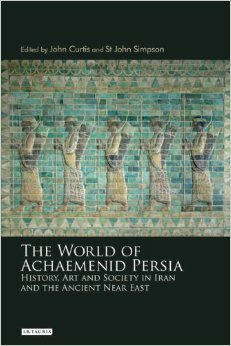 These and many other aspects of the Achaemenid Empire will be explored in this conference which has attracted over fifty international speakers. A collection of the papers presented were published as a book in 2010, edited by Drs John Curtis and St John Simpson of the British Museum.